Is turban a hat? Why some Sikhs wear it and some people don't? Why turban? Is hot in it? These are the question I've asked my hubby when I was first introduced to Sikhi. 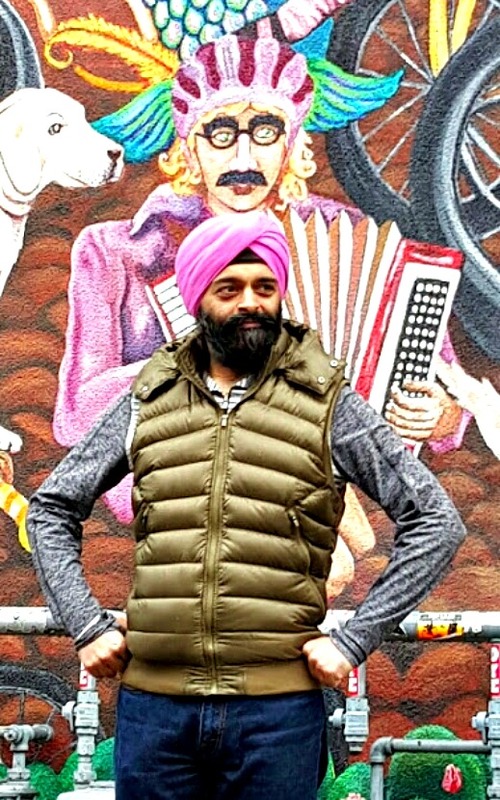 Rupinder Singh, founder of American Turban, social justice fellow at the Sikh Coalition, and owner of more than 20 turbans answer all these questions pretty good. As a follower of the Sikh faith I am, by design, recognized by my turban and my uncut hair. Sikhism is a religion of about 25 million people around the world. It’s the fifth largest world religion by population. Most of the religion’s followers are in India, but there are about 500,000 Sikhs in the United States. That’s a lot of turbans! And this simple item is the subject of a lot of unnecessary misunderstandings. So here are answers to the 10 questions I just know you want to ask about my turban, but were too afraid to ask. 1. Why do you wear a turban? We were way ahead of the hipster man-bun curve. While the turban is a common and fashionable item of clothing for many cultures, for Sikhs, it represents our faith. When the Sikh faith was developing from the 15th through 18th centuries in South Asia, the turban was worn only by the higher classes and elites of society. However, a core teaching of the Sikh faith was that all people are equal — there are no high or low among us. As such, it was mandated that all Sikhs initiated into the faith cover our heads with a turban, thereby signifying the equal status among the faith’s followers. Because it’s considered respectful for Sikhs to keep our heads covered when in public and in our religious spaces, the turban provides that function as well. It is a core piece of my identity. Another identifying article of faith for Sikhs is maintaining uncut hair by both women and men. Sikhs are not to cut hair from any part of our bodies, which is why as a Sikh man I have a long beard and long hair. This is an expression of our acceptance God’s will. My turban becomes the covering for my long hair that I keep in a bun at the top of my head. You see, we were way ahead of the hipster man-bun curve. The author, sporting one of his many pink turbans. 2. Do women wear turbans, too? Among Sikhs, the turban has traditionally been worn by men, while women cover their heads with a long scarf called a chunni or dupatta. However, many Sikh women have adopted the turban as their head covering as well. 3. But I have a friend who is a Sikh and doesn’t wear a turban. Why not? Like any group, there is a range of practice. Many followers of the faith don’t wear turbans or keep their hair, but still legitimately follow and identify with the faith. 4. Do the colors of the turban mean anything? I have more than 20 different turbans, each a different color. There aren’t any religious meanings associated with a given turban color. A person can wear any color turban they like — and even prints! Some colors like orange, blue, and white are traditionally worn during religious celebrations or occasions. Red is traditionally worn during Sikh weddings. One of my main decision points during my morning routine is to determine what color turban I’m going to wear, and how that will coordinate with my shirt, pants, jacket and shoes. I have more than 20 different turbans, each a different color. I’m particularly proud of the four shades of pink that are quick to brighten up a gloomy day for my coworkers. My color choice is a complicated algorithm that usually results in the wrong choice, but luckily, you all don’t notice or you don’t want to hurt my feelings by pointing it out, bless your hearts. 5. Does it go on like a hat? The turban isn’t a hat per se, and we don’t wear it like a hat. The Sikh turban is a long piece of cotton, typically up to six yards long and one to two yards wide. Your mileage may vary. Mine sure does. I tend to wear shorter, narrower lengths of fabric, which I re-tie every day. To put it on, I fold the cloth several times (a process called making the pooni) into a single layer that I then wrap concentrically around my head in four layers (or a larh), but more often Sikhs wrap turbans around five or more times. It takes me a precious five or so minutes to tie my turban — precious because I usually run late to wherever I’m going. You can watch a similar process (at your own risk) here. 6. How many kinds of turbans are there? There are several different general styles of turbans that people wear, and within each style there’s a lot of leeway according to their person’s preferences. Adumalla is a larger, rounder turban. There is a smaller round turban tied by someSikh men. Sikh women who tie turbans tend to wear round ones as well. Aparna is a smaller round turban often tied using a thicker printed/checkered cloth. I tend to tie what’s most commonly referred to as the paghri or pagh, which is more angular in shape (like this one or this one). Within this style, there are regional differences — British Sikhs and African Sikhs tend to wear smaller, sharper turbans (using starched cloth) compared to North American Sikhs, whose turbans are generally softer. Indian Sikhs will often tie larger turbans. Apparently, size matters. 7. Where do you get your turbans? I typically get my turbans from South Asian fabric shops, online turban retailers, or at Sikh festivals. The cost can vary ranging anywhere from $3 to $10 a yard depending on the where I buy from, the type of cotton blend, and any print or design. As for care, many people will hand wash their turbans, though I put mine in the washing machine set on the delicate cycle and hang to dry. 8. Were you born with a turban on? No, and my mom couldn’t be happier about that. When I was a kid and my hair got long enough, my mother would tie on me (until I could) what is known as a patka — basically, a rectangular cloth tied around my head like a bandana that covered my bun of hair. Most boys will wear a patka until they learn how to tie the full turban, and many will instead have a handkerchief just covering their hair bun on the top of their heads. Young boys will wear a patka or a handkerchief since they’re easy to tie and can stand up to some roughhousing. Sikh men will also often wear a patka when playing sports. There’s actually a ceremony in which we celebrate when a child ties their first full turban. We call the ceremony dastaar bandi (meaning “turban tying,” coincidentally enough). It’s often characterized as a “coming of age” ceremony, but it’s not a hard and fast rule. I had my ceremony when I was maybe four years old — I was an overachiever back then — but I didn’t start tying my full turban until I reached high school 12 years later. 9. Do you wear it to sleep or shower? Flowing water can be fatal to a tied turban. Nope. Sikhs are supposed to keep their heads covered when in public. Accordingly, I don’t wear mine when I sleep and not in the shower, especially since it’s not waterproof. Actually, flowing water can be fatal to a tied turban. We can be rather hydrophobic when it rains. I will say, however, that my turban does make for a convenient pillow during air travel. 10. Can I touch your turban? Well, I’m glad you asked. I don’t know — can you? Personally, it’s a bit of a sensitive topic. Like many Sikh children, I was bullied quite a bit in school, and my patka was the target of my harassers. Bullies would try to pull it off, or just try to mess with it. This was obviously very humiliating to me as a boy, given the sacred nature of our turbans. As an adult, I still get asked this from time to time. Because the turban is a religious article of faith, it’s held in sacred esteem by Sikhs. It’s offensive if our turbans are touched or handled without our permission while we’re wearing them. But, if the person asking is respectful and genuine, then I’ll let someone touch it so they can get a sense of it. Play your cards right and I can even tie one on you. Don’t worry, it doesn’t mean we have to get engaged or anything. 11. And oh yeah, the heat thing. You would think that tying layers of cloth on your head would be uncomfortable on a hot day, but actually, the turban is a common article of clothing in hot climates. It protects the wearer from exposure and the sun’s rays. So, while it canfeel hot wearing a turban, it’s because it is hot. No turban is not a hat, its a type of cloth which is worn by the Sikh people on their head. Why some Sikhs wear it and some people don't? Why turban? 3. Preserve the Sikh identity.